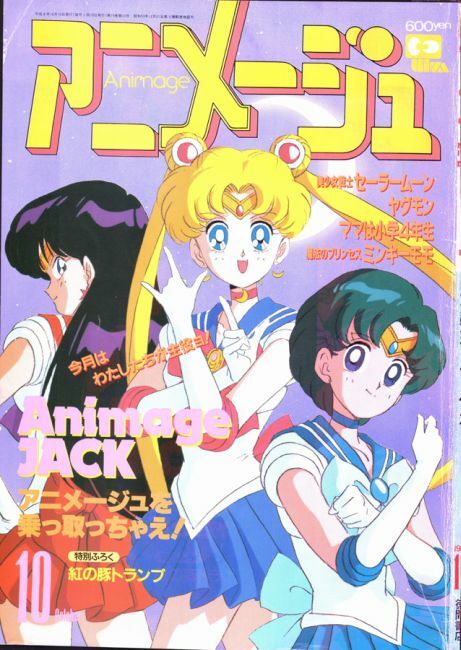 Now that we’ve gotten the serious attack suggestions out of the way, it’s time for us to delve a little deeper into Animage’s mail bag and look at some of the… less likely ideas for attacks recommended by Sailor Moon fans, way back in the summer of 1992. Thought I can’t really imagine any of these attacks ever really appearing in the anime or the manga, it’s nevertheless a fun look back at the fandom in the early days of the series. 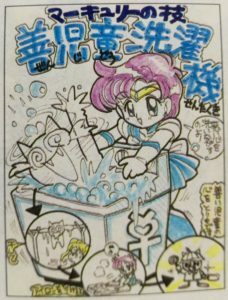 Back in April 1992, Animage1 ran a contest for fans to propose characters, attacks, and story ideas to take place in the Sailor Moon universe. The results of this first contest were judged by members of the production staff and resulted in new catchphrases for Sailor Mercury and Sailor Mars being adapted into the show. And I’m guessing you want this in English, huh? Fine. 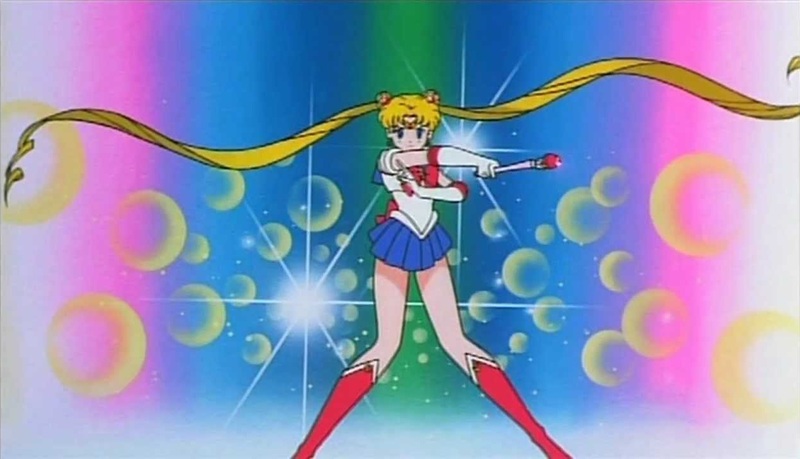 The theme this time around is: a special attack that Sailor Moon, Mars, and Mercury can all use together. It’d be even better if it could be used by four, or even five (?!) people. Also, Usagi and the gang think that even youma shouldn’t have to die, so you should make it an attack that uses love and doesn’t need to kill. Possibly most of interest here is that this may be one of the first times where it was hinted publicly that there would be other Sailor Soldiers. 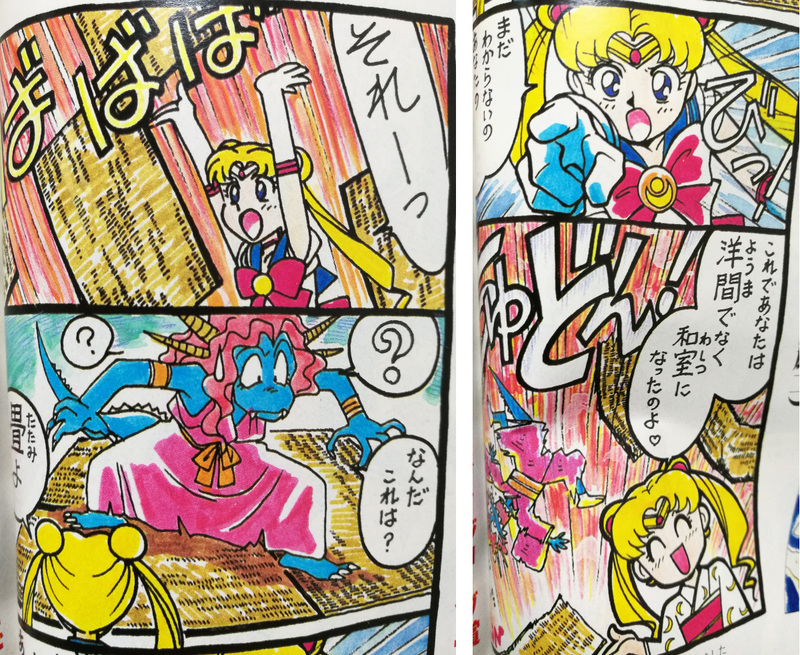 This also seems like around the time that the anime staff had decided that Sailor Moon wasn’t going to kill her enemies like in the manga. Interesting! With that background out of the way, let’s take a look at some of the fan submissions! Each of the Sailor Soldiers clasps their hands in front of their chest, summons their love energy, and lets loose an attack on the youma. The youma gets hurt by this mystical energy and turns into a rabbit, before being whisked off to the moon. I actually kind of like this a lot, if I’m totally honest. It’s not so much because I’m infatuated with the idea of the enemies turning into rabbits and rocketing off to the moon, but rather that I really like the idea what they would need all of their powers combined3 in order to defeat enemies. In what is perhaps the most adorable thing I’ve seen all month, the artist does a nice word play on 全自動 (zen-jidou; fully-automatic) and 善児童 (zen jidou; good/well-mannered kid) and goes so far as to illustrate a step-by-step attack for Sailor Mercury. First, she shoves the enemy into a washing machine to wash away their evil. Next, she hangs them on a clothes-line to dry. Third, she lays the enemy down and irons our all the creases. Finally, the youma has reclaimed their newly refreshed heart! If this doesn’t warm your soul… I really don’t know if I can help you. I think we can pretty cleanly – pun intended – say that this attack never had a chance of appearing in the series, though. 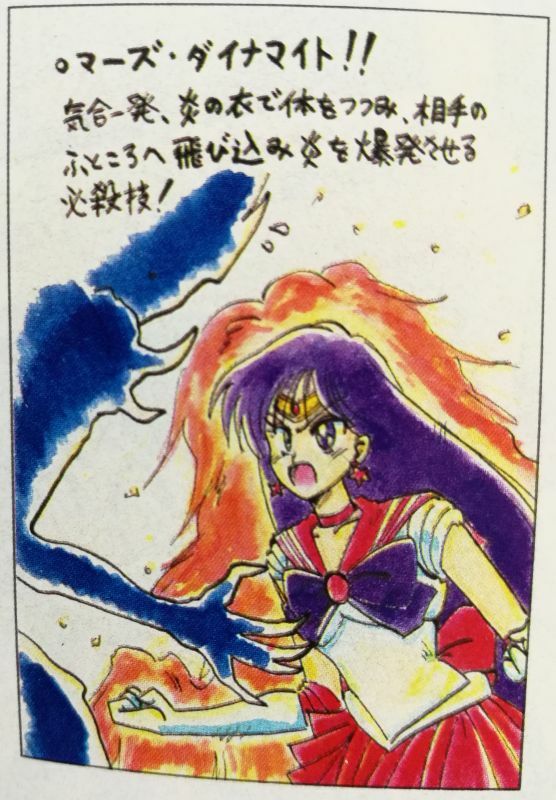 Clearly having missed the memo on today’s theme being about love and non-violence, this submission describes an attack in which Sailor Mars summons up her inner power, her body becomes covered in flames, and she launches herself straight into the enemy. I really like the premise of this attack, but for some reason there’s just something I can’t get behind with it being an attack in the Sailor Moon universe. It might have something to do with the fact that it is, at it’s core, more of a magical series rather than them directly engaging in physical combat. Still, though, I think it could have been a cool attack, if pulled off right! 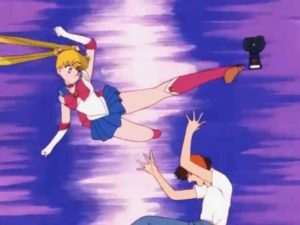 This was, pretty surprisingly, actually the attack that was loved across the bored by all members of the selection team – though that’s probably more out of the pure comedic value than applicability to the Sailor Moon universe. Read also: Was Makoto a Member of a Gang? The clever (??) pun here being that, depending on the kanji, youma can mean either the monster (妖魔)4 or a western-style room (洋間).5 By filling the room with tatami mats, she’s now turned the room into a washitsu,6 is a Japanese style room. And this, my friends, is why explaining jokes is brutal – it just kills it. 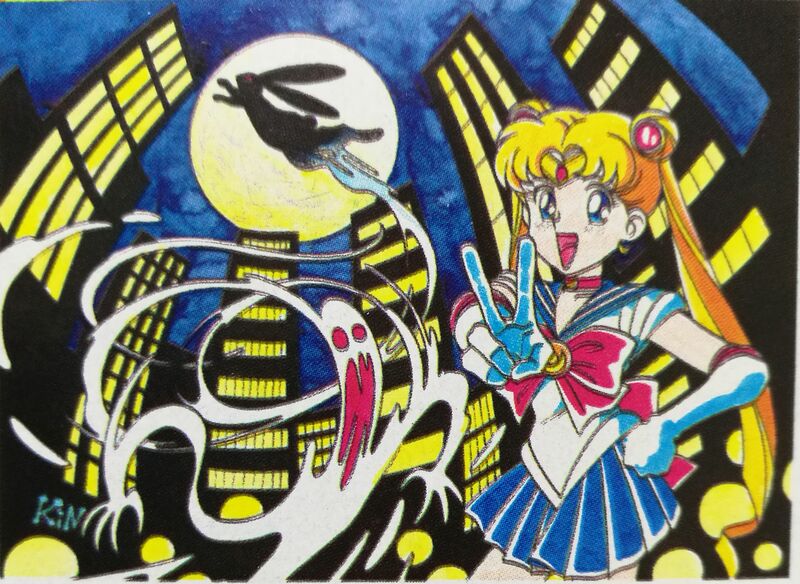 Anyway, that’s it for the rest of the attack suggestions sent in by fans for the Second Sailor Moon Competition. It turns out there was even a third one put on by Animage, so I’m in the process of trying to track it down now. What do you think about the idea of a group attack, which seems to be the direction they were trying to lead it in? I know we later got the Sailor Planet attack, but other than that do you think that group attacks could fit in with the Sailor Moon universe? I’d love to hear your thoughts! ← What Was Sailor Moon’s Archery Attack? OMG the washer… Too cute!! Thanks for digging up these sources for us out here!!! These sound really surreal. Mars Dynamite kind of reminds me a bit of Kaio-ken, though I think something more spiritual based would have fitted the concept better. And Mercury’s I have to say, is just genius. Especially given that her first attack involved bubbles. I notice both her and Mars have different hair colours in the images, was that a mistake or some kind of artistic license? Kind of shame these didn’t make it into the series, via some gag/dream episode. Sentai it should be worth noting, occasionally did attacks much like this on opponents. Like pulling them into fictional scenarios, or disguising themselves. I also quite like the idea of each Senshi having their own special attack, that needed two or more additional members to activate. I’m wondering what sort of ideas we could have got for Jupiter or Venus. You know, I didn’t even really notice the hair color thing, but you’re absolutely right. For Mercury, I think this was actually drawn by the person submitting, and it looks like it was drawn with markers and color pencils. It could be just that they only had so many colors on hand, maybe? Lots of other blues in the picture, so pretty limited in choices for her hair. As for Mars… maybe just artistic license? It has a very Scooby Doo-like feel to it, to be honest. I think it could have been fun if, instead of those clips episodes that everyone hates, they did one kind of side/spin-off every once in awhile that was a little less serious. 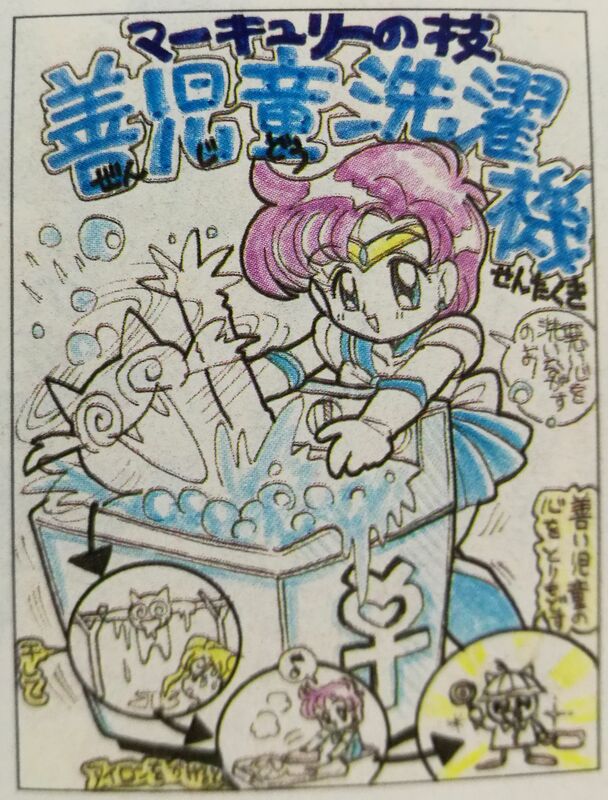 Sure, it wasn’t totally in the Sailor Moon universe… but how cool would it have been for Mercury to throw a youma into a washing machine and Usagi blow up some tatami? ?